- CHIKARA Two Eyebrows Are Better Than One (January 27, '08) = Amasis, Tim Donst, & Mike Quackenbush lost to Claudio Castagnoli, Lince Dorado, & Ophidian. - CHIKARA Passion And Persistence (April 20, '08) = Amasis fell to Helios. - CHIKARA Cafe Culture (May 17, '08) = Amasis was beaten by Hallowicked. - CHIKARA Young Lion's Cup VI, Night One (June 13, '08) = Amasis defeated Ultimo Breakfest, then lost a "Six-Man Elimination" Match to Vin Gerard in the Young Lion's Cup Tournament. Pelle Primeau, Pinkie Sanchez, Stupified, and Drake Younger were the other participants. Fire Ant won the tournament. - CHIKARA The Artistic Pursuit Of Being Yourself (September 20, '08) = Amasis, Gran Akuma, Mike Quackenbush, Player Dos, & Soldier Ant defeated Hallowicked, Icarus, Ophidian, Player Uno, & Worker Ant. - CHIKARA Cibernetico Begins (November 15, '08) = Amasis competed in the "Torneo Cibernetico" Match, which was won by Equinox. - CHIKARA Revelation X (January 25, '09) = The Osirian Portal retained the CHIKARA Campeonatos de Parejas Titles, beating The Colony (Fire Ant & Soldier Ant). - CHIKARA If The Airplane Is Snowed In, Put Your Bloody Skis On And Get Going! (February 20, '09) = The Osirian Portal took down Lince Dorado & Jimmy Olsen. - CHIKARA Motive, Means, Opportunity (February 21, '09) = Amasis lost to the CHIKARA Young Lions Cup Champion, Equinox. - CHIKARA Never Kneel At The Altar Of Conformity (Super No Vacancy) (July 31, '09) = Amasis defeated Lince Dorado. - CHIKARA Throwing Life's Instructions Away (November 21, '09) = Amasis won, via DQ, over Carpenter Ant. - CHIKARA King of Trios '10, Night Two (April 24) = Amasis lost a "Rey de Voladores Eliminator" Match to Matt Cross. Malachi Jackson and Flip Kendrick were the other participants. - CHIKARA Aniversario Zehn (May 22, '10) = Amasis defeated Green Ant. 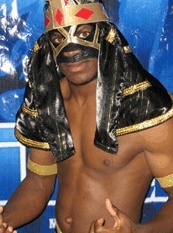 - CHIKARA Aniversario Elf (May 23, '10) = Amasis lost to Vin Gerard. - CHIKARA Young Lions Cup VIII, Night One (August 27, '10) = Amasis defeated Chrisjen Hayme, then lost a "Six Man Elimination" Match to the eventual winner, Frightmare, in the Young Lions Cup Tournament. Christian Abel, Johnny Gargano, Kaio, and Akira Tozawa were the other participants. - CZW It's Always Bloody In Philadelphia (October 9, '10) = Amasis lost a "Four Way" Match to Rich Swann. Ryan Slater and Sabian were the other participants.